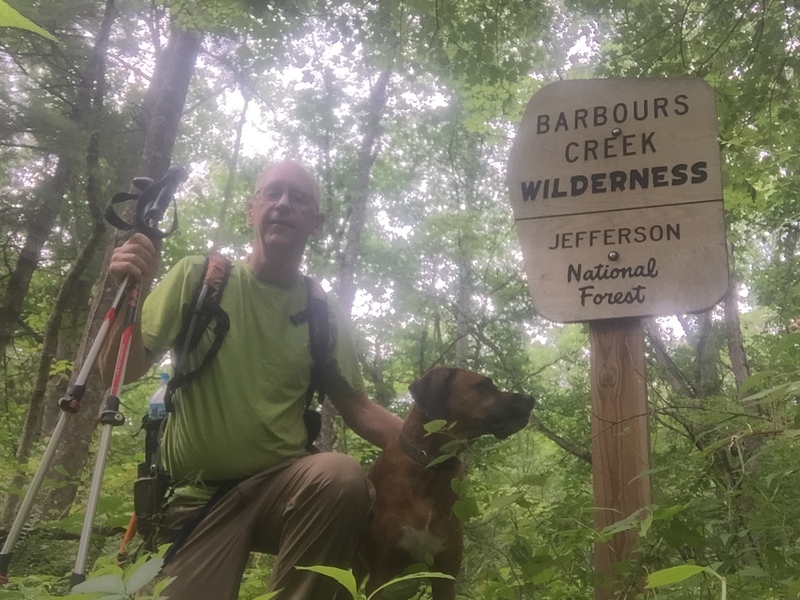 An early start on Sunday, July 5th eventually brought me to 3 different wilderness areas in one day, as I continue to add to my totals for the year as part of the Dirty Dozen Wilderness Hike Challenge. Total mileages hiked, 12.0 miles. Total miles driven, 317 miles. A pre-dawn rising had me arriving at Caldwell Fields in the Jefferson National Forest at 8:15 on July 5th, 3 hours and 165 miles from home. Early sunrises are great! I parked at Caldwell Fields, on the edge of the Brush Mountain Wilderness, a relatively new wilderness (2009) that is one of the smaller wilderness tracts in Virginia – at 4707 acres, it is the 16th largest of the 24 Virginia wilderness areas. It is very close to the Virginia Tech campus. Descriptions of this wilderness I had found online indicated that the slopes of Brush Mountain are very steep and rugged, and there are no trails inside the wilderness boundaries. July is probably not the best time of year to visit a Virginia wilderness without trails, as the undergrowth could be thick and prickly, but I had never before visited this wilderness, so it was worth a shot. Without any trails, there isn't a trailhead for hikers into the wilderness. I figured Caldwell Fields was the best access point. View of Brush Mountain from the Caldwell Fields parking lot. Caldwell Fields is a recreation area in the Jefferson National Forest and is an unsettling place to visit. Back in August, 2009, two Virginia Tech students were murdered there. They were high school sweethearts, found the next day by a guy walking his dog. The murder has never been solved. Link. Caldwell Fields has a picnic area with one table, and a couple of group campsites. There is a privy next to one of the campsites. Stream alongside of Caldwell Fields is the boundary for Brush Mtn Wilderness. Notice the wilderness boundary sign on the tree. I waded through high wet grass in the field down slope from the parking area and ducked into the forest before coming upon a stream with wilderness boundary signs on the other side. I was already soaked at this point! Once under forest cover and inside the wilderness, however, the going was much easier. I headed south over flat ground and passed several small campsites in the woods. View back to the parking lot from the top of the cliff. Beyond those campsites was a 100 foot cliff. Eyeing the cliff, I saw an area that I could climb. Figuring I could have a nice view at the top, I scaled the steep ascent, switchbacking where I could in order to keep my ascent at a barely manageable 42% grade. On the top of the ridge, I got that view and more. At the top was a hunter or game trail. I figured I would follow the trail until it petered out or until the terrain became too steep to continue. The mountain never became as steep as my initial encounter, with the upper half averaging a 27% grade. I followed that trail all the way to the top of the mountain and crossed the southern boundary of the wilderness, coming out on an old woods road along the mountain crest. Along the way, I spied several shotgun shell casings, a couple of water bottles, and a deflated Mylar balloon – all evidence that I hadn’t completely escaped the civilized world. View of Brush Mountain from along the trail. Not a lot of views on this hike. After wandering a little ways down the woods road, I returned to the same trail, taking that back to my car. Though I was feeling pretty good about myself for crossing a wilderness area with no established trails, I did not want to risk hiking a different ridge and finding a cliff that I couldn’t descend. The hike was only 2.8 miles total in the wilderness, as this trail went straight up the mountain. But there was great satisfaction in crossing the entire wilderness without the benefit of an established trail. I won’t be back to finish the entire 10 miles for this challenge – there is too little time and too many other places to explore – but I count this wilderness as one my bigger accomplishments in the challenge. Wilderness boundary and hunter trail as seen from the south/upper elevations of the wilderness. Somebody must come up to enjoy the view pretty regularly! Woods road on the crest of Brush Mountain. Five miles up the road from Brush Mountain Wilderness is the Brush Mountain East Wilderness. This wilderness is also new, added to the system in 2009. And it is even smaller than Brush Mountain Wilderness – at 3700 acres, it is only the 20th largest wilderness area of Virginia’s 24 reserves. But I would estimate conservatively that Brush Mountain East receives 25 times as many hikers as Brush Mountain, because of the single trail traversing Brush Mountain East. That trail is the Appalachian Trail. I had previously hiked this part of the A.T. as part of a small hiking group led by the Roanoke Appalachian Trail Club, so I knew what to expect. From the south, the A.T. crosses several bridges recently rebuilt by the Roanoke Appalachian Trail Club before entering the wilderness. The first mile of this hike is exceptionally pretty, if somewhat circuitous. After that point, the trail ascends the mountain in earnest, switchbacking occasionally to maintain a pretty constant 12% ascent (compared to the 27% grade I had hiked earlier that morning). After 3 miles I exited the wilderness and came to the same woods road that formed the southern boundary of the Brush Mountain Wilderness. The A.T. uses this woods road for several miles, traversing the edge of the wilderness, before re-entering the wilderness as it descends off of the mountain. I planned to access the A.T. from the road on both ends of the wilderness to achieve 10 miles in the wilderness. I continued on the woods road to the Audie Murphy Monument. Though located just outside the wilderness, it seemed un-American to be hiking on Independence Day weekend and not stop to honor one of America’s great heroes, at a site near where he crashed his plane ending his life, back in 1971. On the way back, I stopped and talked with a small group of teenage hikers and their guides. They were from a camp called "Wilderness Adventure at Eagle Landing" and were nearing the end of a 4 day backpacking trip that had taken them past Dragon's Tooth, among several landmarks. I was impressed with the group, and the smiles on the boys' faces. Maybe I need to push my scouts for longer trips. Near the end of this hike, just outside of the wilderness on my way back to the car, I came across an interesting problem. On the longest of a series of bridges crossing Craig Creek, in the middle, was a large black snake enjoying some sun. Black snakes aren’t poisonous. In fact, they are beneficial by controlling rodent populations. But I didn’t think I could reason with Gracie the Fabulous Hiking Dog on this point. I leashed GTFHD tightly and kept the snake away with hiking sticks as we carefully crossed the bridge. I am not sure that GTFHD knew why I was suddenly holding her tight, or why I breathed a sigh of relief after crossing. But this wasn’t the last bridge issue I would experience this day. Gracie the Fabulous Hiking Dog eyes a black snake halfway across the bridge. 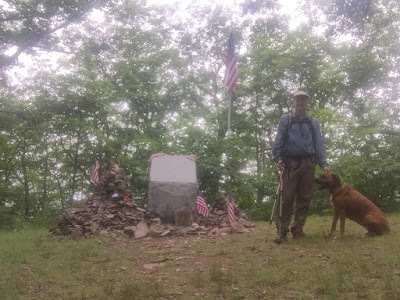 My original plan was to ascend the mountain on the A.T. heading northbound, visit the memorial on the top of the mountain, descend back down the mountain on the same route, then drive north to the next road crossing and reenter the wilderness to complete my 10 miles hiking southbound. 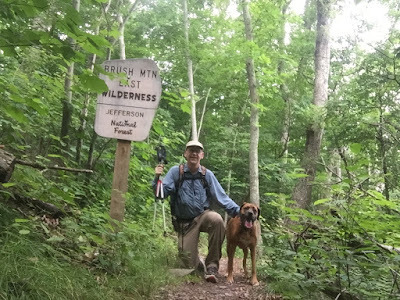 (Every wilderness under the challenge should have 10 miles hiked, and, though others claim it as "wilderness miles" under this challenge, walking on the ridge road is outside the wilderness boundary.) But plans don’t always turn out. After completing the southern portion, I drove to the northern parking area only to discover that I would have to either ford a stream in my car or drive over the stream on a rickety bridge with a sign saying “Private Bridge.” There was a really terrible worst case scenario getting to the northern trailhead, one that I chose not to risk. So I ended up hiking six miles in Brush Mountain East this day (8.2 miles total on this part of my day) and decided to check out Barbours Creek Wilderness on my drive home. Kind of on the way home. Not really on the way to anything. 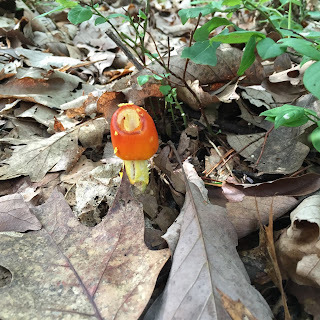 I had never hiked Barbours Creek Wilderness and really didn’t know what to expect. But it made a good “Plan B” when my original hike plan at Brush Mountain East fell victim to difficult trailhead access. Interestingly, the wilderness.net website makes no mention of trails in Barbours Creek Wilderness, but my go-to bible of information on Virginia wilderness areas, "Wild Virginia: A Guide to Thirty Roadless Recreation Areas Including Shenandoah National Park" by Steven Carroll and Mark Miller, states that there is a single trail through the wilderness. So I negotiated a series of back roads to find myself at the Lipes Branch Trail’s parking lot trailhead. Fortunately it was signed at the road and there was an information kiosk in the parking lot – though all the information had been stripped off of the kiosk. Heading up the trail, there was a new wilderness sign (shown above), but the trouble began soon after. I had brought a pair of loppers with me, just in case. They were in use right away to cut back on overgrowth. But after only 1/10th of a mile, the trail was totally overrun by a tsunami of Stinging Nettle. Stinging Nettle thrives in wet areas and grows to shoulder length by this point in July. My loppers weren’t going to help me get through that, and I have lost enough wars with Stinging Nettle on hikes in the past to know that continuing forward would not be a lot of fun. So even though I know that the trail would leave the nettle once it starts ascending the mountain, a sea of nettle had me turn around. This IS the trail, and those plants bite. This is a wilderness area to be explored at another time, after the frost slays the evil nettles. I will put this on my list for winter hiking but will not return here as a part of the Wilderness challenge. Ironic – my hikes this day included several miles through a trail-less wilderness, but only 1000 feet in another wilderness on an established trail. Near the trailhead is a remote campground called The Pines. I drove the loops to the campsites, hoping that a side trail to the Lipes Branch Trail might present itself. No luck. The Pines had 4 campers scattered among its 10 spots. The campground itself looked pretty tired - it is clear that Jefferson National Forest is not putting much investment into this property. It is really remote! But it has a couple of privies and some garbage cans. There is a pump for water. And each site has a picnic table. There is no charge with this campground.